Located in Northern Missouri, the city of Trenton and its more than 6,000 residents pride themselves on self‐sufficiency and pragmatic decision making. During the spring of 2012, the utility embarked on the design and construction of chemical feed system upgrades at the existing water plant that would help the city manage the need for new capacity, better control of trihalomethanes (THM’s) and improve operator safety by removing gaseous chlorine as a disinfectant. As with many smaller communities, Trenton water utility personnel were anxious to remove the use of oneton cylinders of pressurized chlorine gas for water disinfection. While gaseous chlorine is cost effective, operator safety and community relations often become deciding factors during the evaluation of existing disinfection practices. Trenton personnel and their engineer partner, Larkin Lamp Rynearson, explored both on‐site sodium hypochlorite (bleach) generation and bulk bleach deliveries. 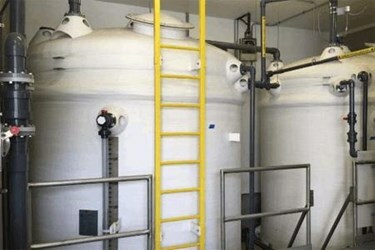 Ultimately, the simplicity of on‐site generation, the self‐sufficiency afforded by only requiring salt and electricity to disinfect water and the easy storage of dilute (0.8%) bleach which did not degrade in hot summer months guided the team to design an on‐site hypochlorite system (OSHG) for the new plant.